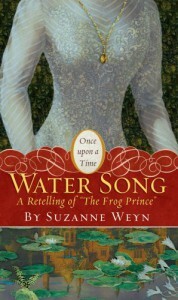 This was a short and very quick read but I liked it a lot.It's a re-telling of the Frog Prince story, set in Belgium during WWI. Emma has travelled with her mother to check on the family estate from England but the two are trapped due to the Germans. Emma's mother is killed during an attack and Emma, trapped and alone, spends her time at the estate, just waiting.Enter Jack- an American who has joined up with the British and Canadians, as the US has not yet joined the war. Fighting in the trenches just below Emma's estate, Jack is caught in the middle of a gas attack and stumbles his way towards water, ending up in Emma's well.The story is a romance and an adventure tale, with the idea being that Emma and Jack will fall in love and end up together, which I am completely fine with.However, I do wish that the author had chosen to work with their relationship a bit more. There is the clichéd "love at first sight" business on Jack's end that felt forced. Emma is set up as a girl from a wealthy family who isn't like all the other wealthy girls... and yet, when it counts, that's how she behaves. There seems to be a bit of disconnect between what the author wants Emma to be and what she NEEDS Emma to be for the story to work the way she wants it to.I did like Emma. Don't get me wrong- she was strong when she had to be but had her moments of "realness" that kept me with her for the whole story. And I really, really loved Jack.The end happened a bit too quick and I wished there had been more of them after the war- this is a story that I could have read hundreds more pages of. I guess the point of the story was the falling in love part, not the staying in love part, so I understand why it ended where it did but... I wanted more!The action was really well written. Some of the language was a bit anachronistic and there were some references that didn't make a whole lot of sense given the context. The Germans felt almost Nazi-esque and there was no real talk about the politics about the war. The author made a point to explain certain things for the YA audience that she's writing for and all of those moments, while recognizable as exposition still flow in the story and move things along. I expected a bit more about the why's and how's of WWI beyond just the offhanded comment Emma makes about the Archduke being assassinated.But I did like this book. It was a sweet story with fun and interesting characters. The use of the fairy tale element was sweet and well done- not at all off-putting or lame.